Leaves for Trees: Have you thought of quitting the blog scene? Cheryl at my Heritage Happens wrote a great post last week about her thoughts on why she blogs. I was drawn to her post by the title "Serious Thoughts to Quit Blogging." The title grabbed my attention because I have been thinking the same thing. I have recently thought of quitting my blog. All kinds of things are running through my head: Why do I blog? Why do I spend so much time crafting posts that very few people read? What keeps me coming back? Can't I spend my time better elsewhere? I initially thought that it didn't make much sense to blog. No family members read my page and my kids are too young to read (even assuming they would care). The information I load helps no one but myself. And then it hit me. Who cares? Who cares if I'm the only one that reads the blog? I have found myself utilizing my blog as a repository of information. In fact, when I need to remind myself of a story or how I'm related to an individual I check my blog first. And if the information only serves to help me, then it's serving its purpose! Then I dug a little deeper. I've met some great blogging friends that are no relation and have nothing in common with me other than our love for the hobby. In fact, I've never met any of the in person. We comment on each other's posts and help with research suggestions. My blog helps them and they help me. That's a great reason to blog. I don't know what my long term aspirations are for blogging or genealogy in general. I sometimes wonder if I could do this for a living, but I know how difficult it is and I haven't decided if I have the skills to move forward. But I do know that even if I'm the only soul that reads the blog that is good enough for me. It doesn't matter how often I post, because it is after all just a hobby page. The fact that blogging friends tune in is a great added bonus. Thank you to all my loyal readers and blogging friends! Have you thought of quitting? What keeps you going? finding out the stories behind the names on all the tombstones that I snap on my camera! Very good post - - thanks for sharing your thoughts! I've found that the effort of writing about my research often leads to more thorough research because I don't want to publish misleading or inaccurate information. It creates some structure for me. I also make an annual printed book of my blog posts to include with my research files. If any family picks up where I leave off, they'll have a better understanding of how I discovered what I discovered (in the event my blog evaporates into the internet ether). I started blogging with the hopes of finding other people researching my lines with brick walls and getting clues I hadn't yet found. Turns out, it looks like I'm the only one. Oh, well. YOU SCARED ME! I read that blog too. I haven't ever thought about quitting. Even from the beginning, I did the blog for me. When Geocities was THE place to be, my page was more of a resource page. When Geocities shut down, I didn't know what to do with my stuff. Years passed. Someone suggested I move my info into a blog. But I knew nothing of blogs except the decorator, DIY, and mommy blogs. 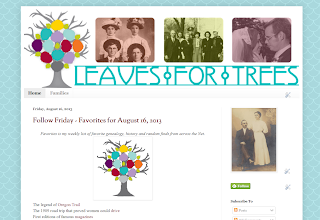 Genealogy as a blog made no sense until I found Geneabloggers. I watched others tell stories. And so little by little blogging made sense for me. I've found a few cousins here and there, but they're not active researchers, for the most part. Now like you, I have blogging friends that I would miss terribly if they adopted a "why bother" attitude and quit. I'm here for the long haul, for better or worse, for seldom or daily. I'm glad for the company. Dorene, thank you for commenting. I agree, the stories behind the people are fuel enough to keep me going! Frances, you make a good point. I also find myself digging deeper to ensure my posts are accurate. In fact, that is one reason why I don't post more because I want to ensure it's as accurate as possible! I like your idea of publishing your blog yearly. Have you written a post about that? I would be interested to see what process/company you use. Thanks for listening, Anne. I think I just needed to vent! Sorry to scare you, Wendy! I hope one day to meet my blogging friends. I think that would make the relationships seem more real and make blogging more tangible. I needed to write the post to recognize why it is important for me to blog...I often feel guilty for blogging instead of doing something else. Whether that is working out, actual research, etc. But I'm realizing that blogging is a way for me to decompress and it definitely works! I'm sorry none of your family members read your blog. I have been fortunate that a lot of my family and my husband's family members DO read mine. They've given me very nice feedback, and, even when I feel like quitting my blog, I know that I just can't because I would be letting them down. My kids are also too little to read mine, but one of the reasons I do keep going is because of them. If they ever get bitten by the genealogy bug, it will be here for them to build off of. yes I had though of it and did quit several times on different bogs I had and then I wanted to start this new blog, but thought to myself why bother. That was till I found Genabloggers and knew there was people out there that like and did the same reserch like I like to do. That gacve me the incentative to get my blog started. You make a good point. I should clarify that I have a small family and most of them are not interested in technology or have access to it. So to be fair they probably would read if they could! But you make a good point: even if my little ones don't care right now, they may some day and that is worth all the work in the world! Quit? Of course I've thought about it. I think about quitting when I feel pressured to write if I haven't written in awhile. Then I remember that I am NOT a newspaper reporter and I have NO deadline! I write for me and have intention one day printing out and/or self publishing the blog to leave behind for my kids and maybe their kids in the case that they become interested. And why wouldn't they? Wouldn't we all KILL to read a blog by one of our ancestors? I record my own personal story right along with what I am learning in my genealogy work. It is all important....at least, to me! Don't quit! I think you'd eventually regret it. Thanks for the comment, Genealogy Stats. I think you are right, knowing that there are other people that enjoy our blogs, whether they are related or not, is great incentive! Pisces49, I agree that I would regret it. I also think I would miss it. But, I think my training as a journalist sometimes makes me feel guilty when I don't post. And I noticed a very sharp drop in page views when I did take a break this summer. But you are right, this isn't a newspaper and I'm not making money. Why make myself feel guilty? In a sense, I think I have quit, a number of times. Every year I seem to go through a period where I just can't get motivate to write, sometimes for months at a time. I pretty much agree with Frances, though - for me, the major point of my blog is that it encourages me to dig deeper, to do better and more complete research, and that it gives me an outlet for putting my research process and results into writing in ways that I probably wouldn't if I didn't blog. I have only been blogging for a little over a year now and I have loved it! I would not thinking of quitting-at least not yet-because of the positive experience it has been. I have met cousins, been able to see wholes in my research, met wonderful people and so much more. For me it a way to get my voice out there. Even if it is only the voices in my head and I am the only one who reads it!! A bonus though...my grand daughter read a post a few months back AND left a comment. That made it worth the effort! Thanks so much for your post. It got me thinking! I'm with you, Kathleen. My blogging seems to make my research better! It definitely points out holes which I wouldn't necessarily find otherwise. Cheri, thanks for your comment! I totally agree with the filling of research holes. And it is an outlet for my thoughts. I have always kept a journal and I should remind myself that my blog is my online genealogy journal! I've gone through some periods where I have trouble getting motivated or can't even come up with something to write about. My grandmother's scrapbook has been great because I don't have to think about it. I write for me although I have a few friends that do notice when I don't write. As an aside, I've made a book at the end of each year of my blog using blurb.com. I'm sure there are others but this has worked well for me. I would definitely miss you, Debi! You are the second person to mention blurb.com today so I will have to check it out. Thanks! I think you have summed up why we keep blogging (I've been typing away since 2006!) and also why we regularly think about stopping. Like you I use my site as a notebook and it is a thrill when I come across others who say they find it useful. I find that blogging helps me to see gaps in a story and get a better feeling for the overall story, rather than just chasing another elusive document. It's also a good way to get things documented in a format that is more palatable to less genealogically-minded relatives. Heather, I'm so with you on some of the feelings I think are common to bloggers. It does sometimes feel lonely pursuing this solitary hobby. I've likened blogging to hollering into an empty room, or shouting into a tin can with no one on the other end of the line. Our minds can play mean tricks on us, and in the blogger's mind, the trick is that no one is "listening." You've had quite a bit on your plate, lately, with such a monumental, cross-country move, and it is quite understandable for you to look at this project of yours within that bigger picture. I'm sure you are taking it all in stride, but it would be understandable if you yielded to the temptation to beat yourself up over "not blogging enough." I've blogged for all the reasons you've mentioned (as well as those others have brought up in the comments). And I can relate to some of the down side: not many in my family read what I'm writing, either--and hey, it's their family, too, for crying out loud! The dips in page views can sometimes get quite discouraging. I'd like to bring up one more reason for blogging genealogy. This is one item that keeps me going (and I've blogged about it before): that what we post on our blogs is searchable online, and will remain online as long as this technology is still accessible. As we pile up our posts, whether diligently done on a regular basis, or on an as-needed basis, they build an archives of our memories and findings regarding our family's ancestors. Who else would tell their story, if we didn't? Thankfully, Google, Bing and all the other search engines become our partners in bringing these stories to light for those seeking more details on these specific people, places and eras. It has been so heartening, in the rare moments in which it happens, to have someone I don't know contact me now about a post I might have made two years ago. It helps me have faith that, two years from now--or maybe even twenty--someone else will stumble across something I've posted and find it helpful. We are not just blogging for our readers now. We are taking our place in the stream of searchable data. As long as the technology allows, the stories we post will continue to be found, long after we post them. That's the reason I keep blogging. So many have already chimed in, Heather, but I'll add a few thoughts, too. Though you may think that few read your blog, as you can see by the response, many do! We would miss you if you quit blogging. At the beginning of my blogging experience I wondered if I could keep up the research AND also blog about it. It seemed to divide my time and attention. And I guess it still does, in some ways. It seems that I go through times when I spend more time researching and less time blogging, then less time researching and more blogging, and then neither of both. And, of course, it's most important to decide our purpose in blogging. Probably one of the best reasons is for ourselves (because, let's face it, with thousands of genealogy blogs, unless we're Randy Seaver, we probably won't have hundreds of readers who respond to our posts). When we do it for ourselves, we can decide whether to put pressure on ourselves to blog every day or lessen the pressure to blog when we have something to say, or share, or that we want to remember. I'm glad you won't be leaving the blogging community, Heather! Even though I don't often comment, I always read. So many good points from everyone! Thank you, Linda, for your thoughts. I also love to hear when my blog is helpful, especially if it helps someone break down a brick wall or connect them with a cousin. Jacqi, we are on the same page. Your idea about the searchable aspect of blogging is dead on. I've had responses from blog posts that are years old...and sometimes that is the best kind of response because it shows the old posts still have value. You are right, we are not just posting for our readers now. Such a great point! Nancy, thank you for your kind words! You made two great points that I wanted to highlight. First, that the pull between focusing on research and focusing on blogging can often be a struggle. However, I am beginning to look at them as one in the same. My blog is my research log and, as others here have mentioned, it is also a way for me to ensure better and more thorough research. And you also mentioned that while you don't always comment, you always read. I completely agree! I read so many blogs, but I don't always comment. And it is a good reminder that we have friends that are out there reading whether we hear from them or not. I certainly would be sad to see any of my blogging friends quit, as I love the concepts, ideas and reading they bring to me on a daily basis! I would like to have more time to blog and research. I do it for myself and for family members to read (now and into the future). I received a private message of thanks just yesterday from someone who had read my blog about a little country village where his family had also originated. It is little things like this that make it all worthwhile. I've had similar thoughts and lately have been thinking that it's slowing down my research. But then I thought that it's also making me a more thorough researcher. I'm probably the main user of my blog and that's OK. It really helps me keep track of what I've already done and where the holes are. I receive emails every once in a while from someone thanking me for posting the information, so that helps keep me going too. Heather, your comments on some of my military records helped me uncover so much more information on those ancestors. My family doesn't read my blog either, so I know how that goes. I think the time investment is worth it overall, so hope we both can keep on blogging! I have thought of quitting. I don't because I do this hobby, in part, to relieve stress from daily life. I too see it as a repository in the form of my genealogy journal/diary. Even if I was the only one reading it, I'd still post. We are thinking the same from quitting to doing genealogy as job someday to...who knows...making it into a book...even if it is just published for the benefit of my children to read someday when they are older. What a conversation starter, huh? Since we're all in the same boat as family history bloggers, I think we all know why we keep doing what we're doing - but when we get overwhelmed or frustrated, it's nice to remind OURSELVES why we do it! I've had to take a serious step back from blogging since I had my daughter in April, but even with the crazy handful that she is, I still can't stop blogging or researching my family tree - in fact, now that I have someone concrete to pass this info on to, I think it's even more important to keep doing it! Thanks for a great post, Heather! Mary Ellen, congrats again on your daughter! I know you are right, I needed to remind myself why I blog and it helped to talk it through with everyone here! zelsersk, I didn't realize you had thought about doing genealogy as a job someday. I have thought about it, too, but I'm not sure I could make a go of it. Maybe after the kids are both in school! Either way, having a repository of my ideas and thoughts is worth it. Thanks! I definitely need you to keep blogging, Kathryn! You provide all kinds of great links for my Friday Favorites. ;) And like I mentioned above, I'm beginning to look at my blog and research as one in the same! Good point, Sharon. It is definitely the little notes of thanks and knowing that we can help others in their research, even in a small way, that makes it worthwhile! My blog is not even 8 months old yet and most of my family do not visit the blog regularly (or even at all). Nonetheless, I view the blog as a way to share widely the photos, data and thoughts I have for those who do choose to visit -- and I think I thereby increase the likelihood that the images, connections and stories will be preserved into the future. The blog is also a way to exercise one's writing muscles and, as you noted, make some new friends and acquaintances that share an interest and passion for genealogy (or as a relative once said to me, "You are really into dead people!"). Please do not give up your blog. I check it and others almost daily and have been inspired and motivated by your content and many others. For example, your fairly recent post on your Dad's first car -- the Corvair -- got me to thinking and I am now embarked on a "First Car" series, the second of which will be this week. Your work inspired that! Great thoughts! I've had them, too. Daily life gives me more than enough to do, but yet I spend time writing posts. But I think it goes back to why some of search our family history: the excitement and 'need to know.' If I post, maybe someday that person with the answer to an elusive brick wall might find me out there! Great piece, Heather. 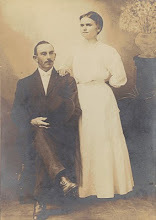 I have been blogging my genealogy for about a year and have very low readership, but it has allowed me to connect with unknown family and like you, it serves as a great repository for my research. I check your blog often for ideas, so do keep up the good work! I haven't thought of quitting blogging as I know I have lots more to share, but I have decided to not feel guilty when I have only four or five posts a month. I know I have a few family members who read and they say they enjoy it. As others have noted, I also find that I refer back to my blogs as a kind of research log. Thanks for sharing your thoughts. Obviously this is good food for thought for us geneabloggers. I can understand your feelings about blogging. It can be difficult sometimes to feel motivated to blog. But, thankfully for me, I know that my mom, my brothers and at least one sister-in-law enjoy reading my blog posts. And I've had positive feedback from some cousins as well. And that makes me feel so good! I've also found that writing about my ancestors has helped me to learn more about them, which I may not have done otherwise. I'm also hopeful that sometime in the future my children will read and appreciate what I've written about their ancestors. Of course, there's the cousin-bait angle to blog writing as well. I'm also hopeful that someday a distant cousin will stumble upon my blog and contact me. So yes, all in all, I think genealogy blogging is quite helpful and worthwhile. Thank you, Jana for your comments and the mention on your fab finds! Thank you for the comment, Elizabeth. I concur, I just need to change my mindset and not feel guilty when I can't post very often. I also like to write posts when I have time and post them in the future when I know I'll be busy. That seems to help! Thank you for your comments and for reading Joe! John, I do remember your post about genealogy knowledge making for a more grounded child. That is reason enough to continue! Thank you for the comments. Great thought, Sally. The "need to know" is great fuel! Please don't quit. It's not just the research or tips you provide, I just look forward to reading what you've found or a memory you've shared. Had you not started the blog, I'd have never found another Dudgeon cousin. Keep up the good work.